From the co-creators of KING CORN, and BIG RIVER, TRUCK FARM tells the story of a new generation of American farmers. Using green roof technology and heirloom seeds, filmmaker Ian Cheney plants a vegetable garden on the only land he's got: his Granddad's old pickup. Once the mobile garden begins to sprout, viewers are trucked across New York to see the city's funkiest urban farms, and to find out if America's largest city can learn to feed itself. "Alternately giddy and pragmatic, Truck Farm makes the best sales pitch for grow-your-own I've ever seen. A must-see for anyone interested in agricultural empowerment and diversity." "'All power to the imagination'--a slogan of those who took to the streets in Paris, France in May 1968--is an apt description of Truck Farm. 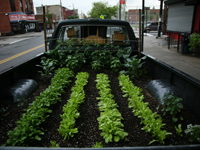 By showing us the possibilities of where and how we can grow food in the city--from truck beds, to windows, to roof tops, to abandoned baseball fields--we can begin to imagine and envision a very different connection to food grown near where we live. It is the ultimate local food argument, but through a distinctive urban edge and food justice lens. All power to the Truck Farms!" "Truck Farm is hilariously fun. Some people will do anything to farm--and that is a beautiful thing. Ian demonstrates the variety of places and ways you can grow your own food, and in an age when nearly two-thirds of the fruits and vegetables we eat in the U.S. are imported, we have to grow more of what we eat. Ian's truck is as good a place as any to start; however, that acre of topsoil-rich farmland Ian and Curt own in Iowa can fully feed 20 families--Maybe that will be the next project." "Truck Farm tells the story, in miniature, of the struggles all urban farmers face, including: land access difficulties, polluted soils, and petty theft of valued produce. Seeing foodie farmers and thinkers of New York City like Marion Nestle, Ben Flanner, and Dan Barber react to the miraculous food-producing truck is priceless." "Truck Farm illustrates a rebirth of interest among young people in agriculture. With passion and ingenuity, you can find a way to farm anywhere." "This film is so mind altering, you will never look at an empty space the same way again, no matter how small!" "Invites the imagination to run free...Given its combination of humor and seriousness, the film makes a good resource for community gardening programs with youth or classes that are studying food systems." "Instructors of high school, undergraduate, and graduate student audiences will each find aspects of the documentary engaging for their classes...Truck Farm is a great discussion resource for introductory sociology courses as well as a platform for questions about social inequality, social movements, and environmental justice...The documentary acts as an important tool to illustrate the impact of alternative forms of agricultural production." "Playfully urges city residents to start growing healthy food wherever they can. Of most interest to teens and adults in New York City but also in other locations where residents are concerned about sustainability and food security." "Uplifting, clever...After watching the video, I felt just like my students and wanted to build a truck farm and my guess is that you will feel the same way." "Offering an interesting look at the world of DIY urban-guerilla gardening, this is recommended." "Eye-opening...An amazing tour of positive efforts toward sustainability, Truck Farm is as much fun to watch as it is educational and highly recommended." "Especially valuable in creating models for under-served urban populations who lack access to farmers markets and other affordable organic-produce outlets...creative and inspirational...I recommend it for classes, families, or general entertainment." "Amusingly narrated while addressing the larger theme of sustainable agriculture...Well-paced..Is both entertaining and informative." "Takes sustainable gardening to a new level...Quirky and fun...Will have viewers contemplating their own garden spots." "A quirky and inspirational look at the ways people have found to grow their own food without a yard or balcony. I hope the message gets out to all of those city-dwellers with an unused rooftop or broken down pickup truck that there is more than one way to turn your property into a prosperous garden."